Pergo 4-in-1 Molding provides everything you need to complete your laminate flooring installation in 1 single kit. This patented innovation allows assembly of 4 different moldings from a single product. Join laminate flooring with a similar height hard surface floor with the T-molding. Use in doorways with a width of 4 ft. or less or in rooms 66 ft. or larger. To transition laminate flooring to a carpeted floor use the carpet transition. Use the hard surface reducer to transition laminate flooring to a lower, hard surface floor, such as vinyl, wood or tile. 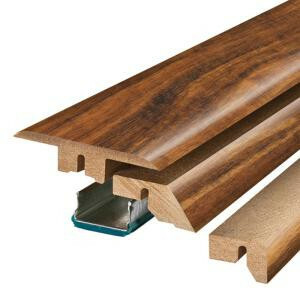 Finish your laminate flooring installation at sliding doors, fireplaces or other fixed edges with end molding. Buy online Pergo Hawaiian Curly Koa 3/4 in. Thick x 2-1/8 in. Wide x 78-3/4 in. Length Laminate 4-in-1 Molding MG001283, leave review and share Your friends.